Tuesday SOL What about the holidays? I am having the most delightful winter break. We have stayed home, relaxing together, lots of special time with family and friends, plus sleeping in, going on long walks, watching movies, writing, reading…yes, delightful! After the wedding in November, this is exactly the Christmas and New Year's that I need! I guess I fall into the third category - I don't celebrate the holidays with my preschoolers. I simply believe that families should be the teachers of the holiday traditions. 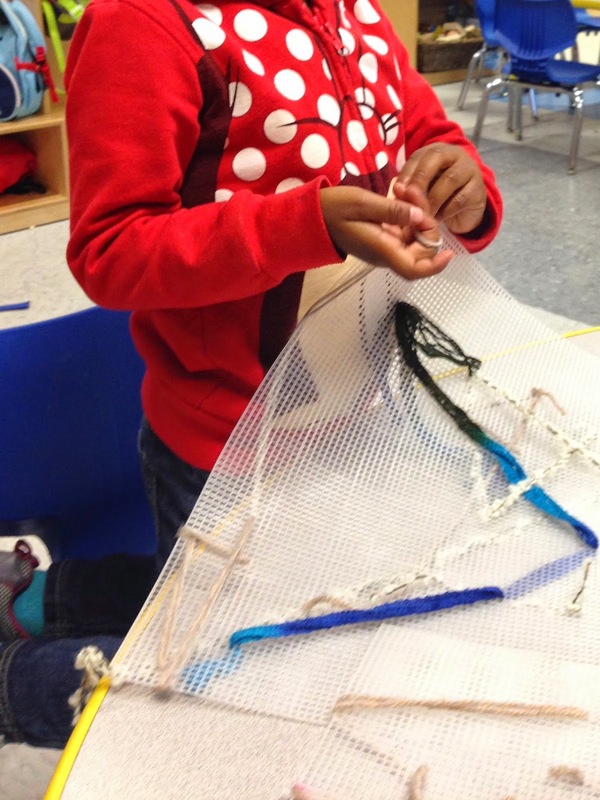 I teach at a public school in Washington, D.C., with families from diverse backgrounds. 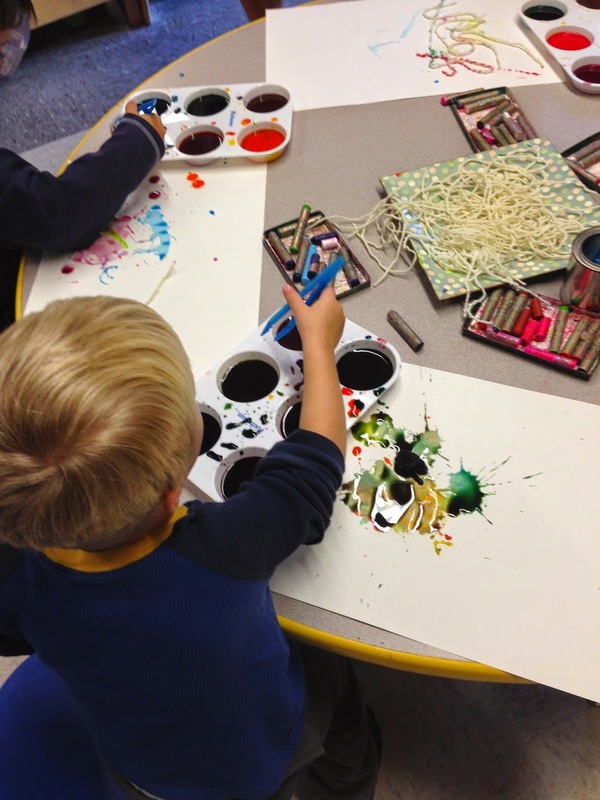 I use the month of December as a time for children to bask in the normal routine…to build, paint, dress up, explore with abandon. Sometimes holidays are mentioned by the children and this is by no means taboo - I ask the children to tell me more, where did they go? what did they do? what happened? 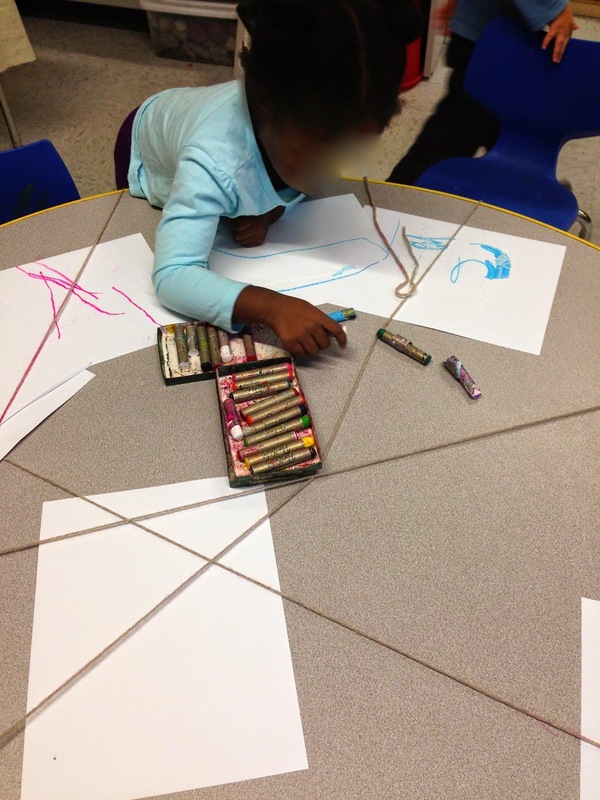 These are ordinary loving, respectful conversations, children learning to share what they know and to listen to one another. These discussions come up organically, not something I orchestrate or pre-plan. 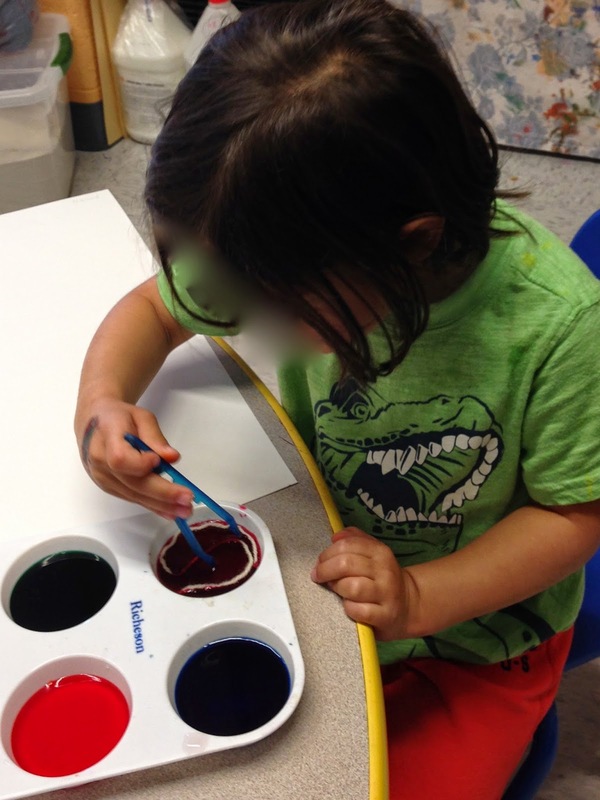 Mid-month, there was a buzz about gifts…wanting to make something for Daddy, wanting to paint a picture for Mommy. 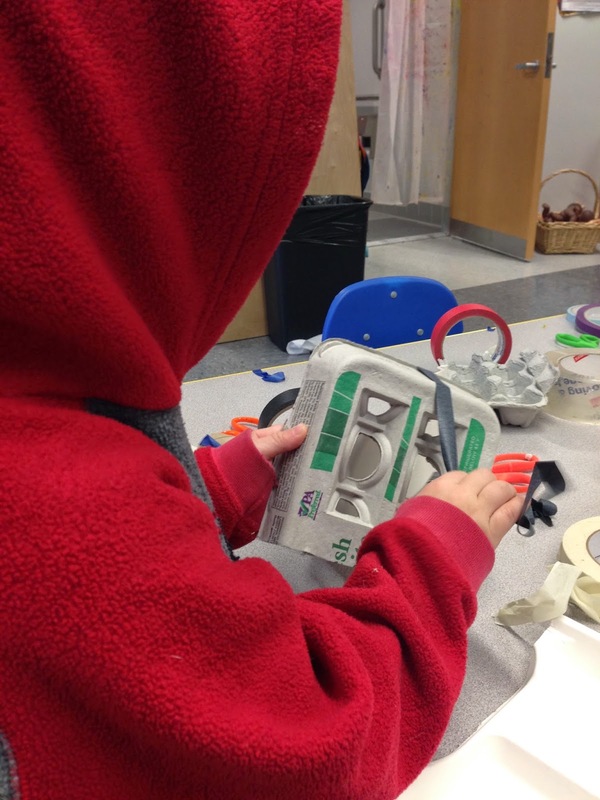 Our engineering with recyclables area took on a whole new focus - what could I create for someone else? 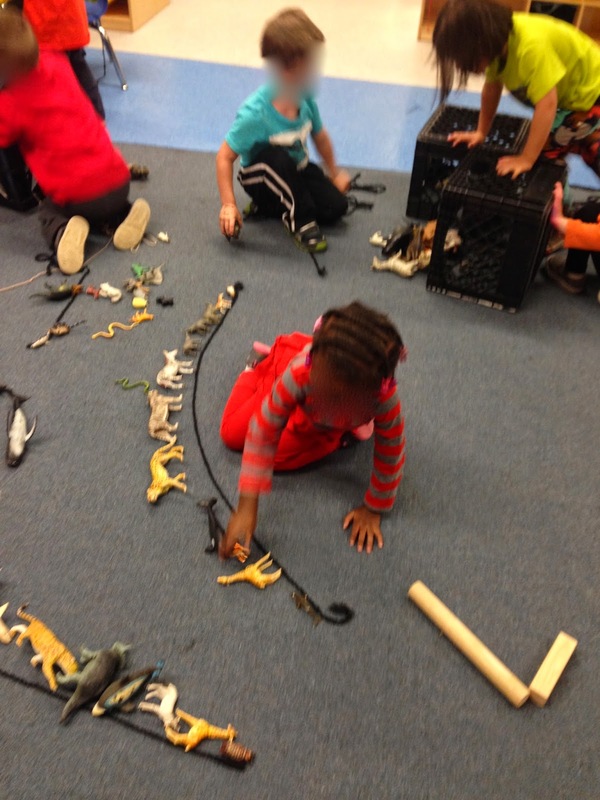 Honestly, this wasn't in my "plan" - my classroom lends itself to this kind of child-directed purpose, child-created fun. We had a beautiful December together and I am looking forward to lots more magic, exploration, laughter, and love in the new year! 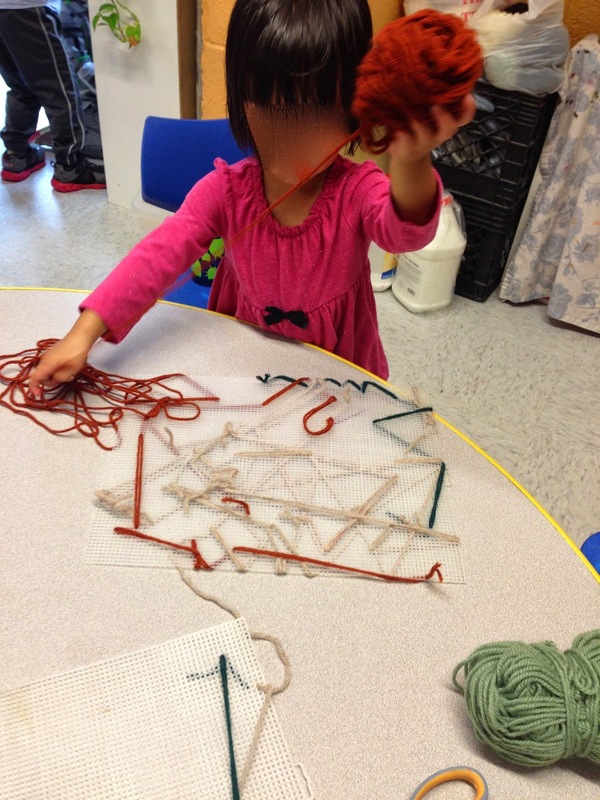 What can we do with yarn? 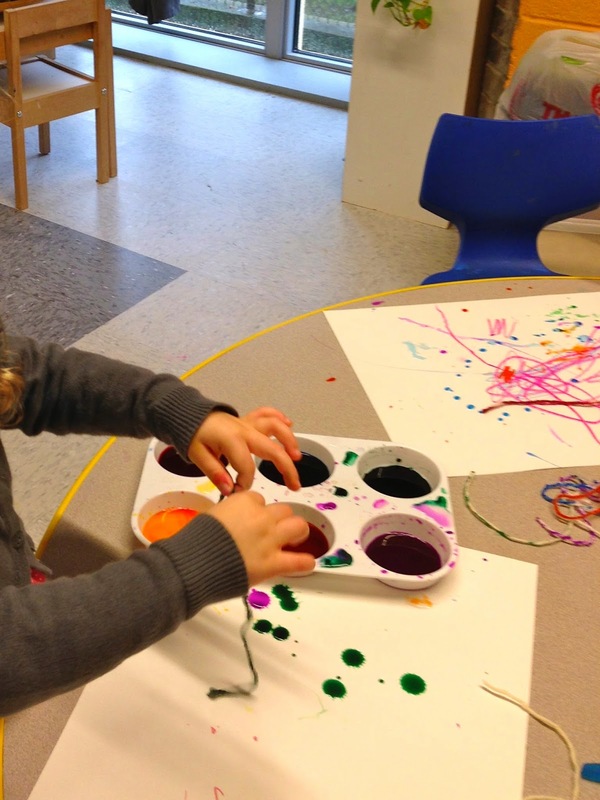 During our first trimester this school year, in every classroom (preschool to sixth grade! 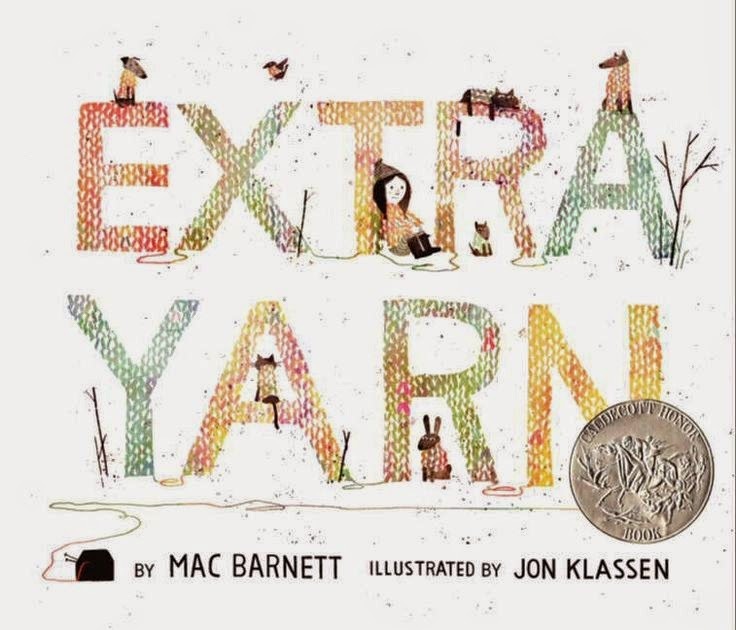 ), students read Extra Yarn, by Mac Barnett. The book tells the story of a child who finds a magical box of yarn that never seems to run out as she knits sweaters to keep everyone in her town warm. 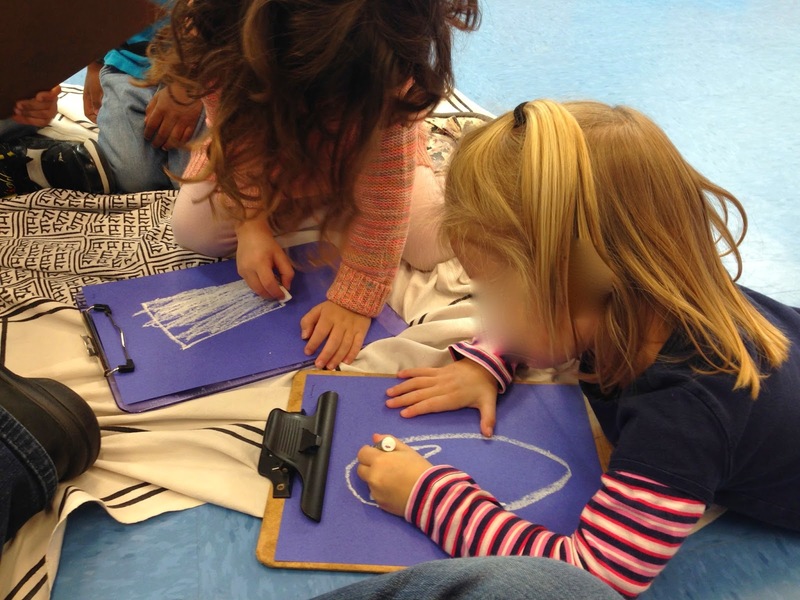 Throughout the school, students wondered about their own personal gifts and how might they share these with others. 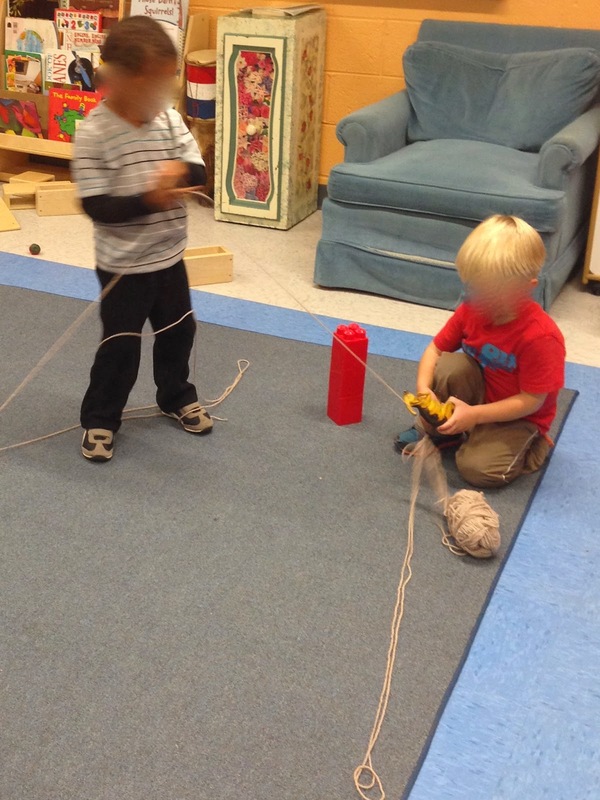 For a couple of weeks, yarn was in every center of our classroom, to be used and explored in any (safe!) way that the children desired. 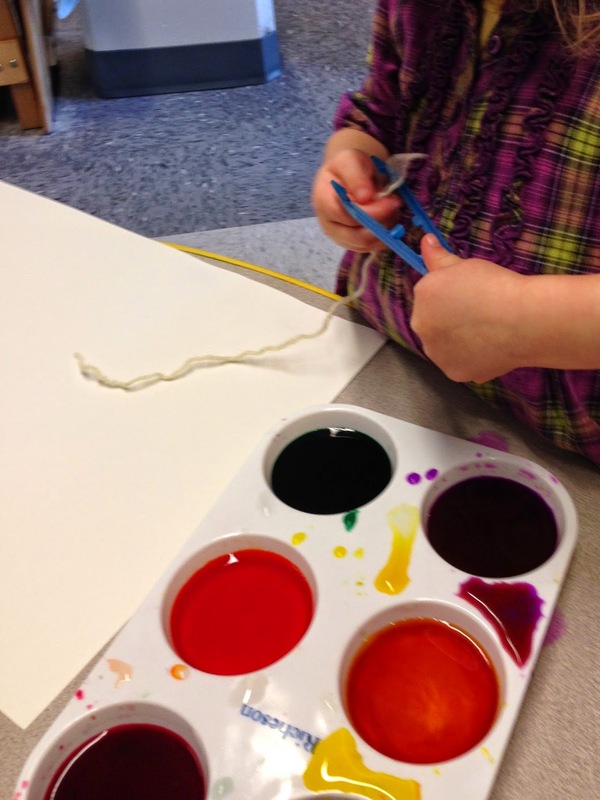 My favorite yarn activity was dipping yarn in watercolor paint, changing white yarn into a new color. 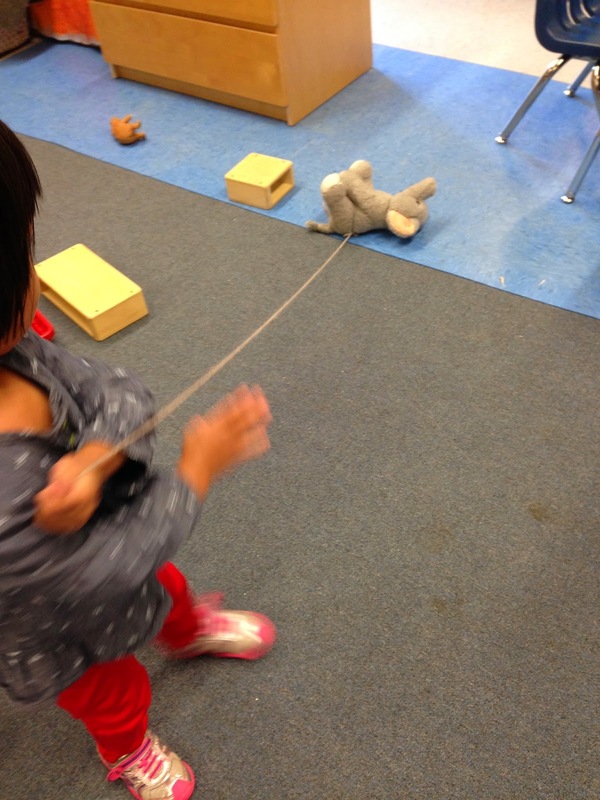 We repeated this activity over many days. 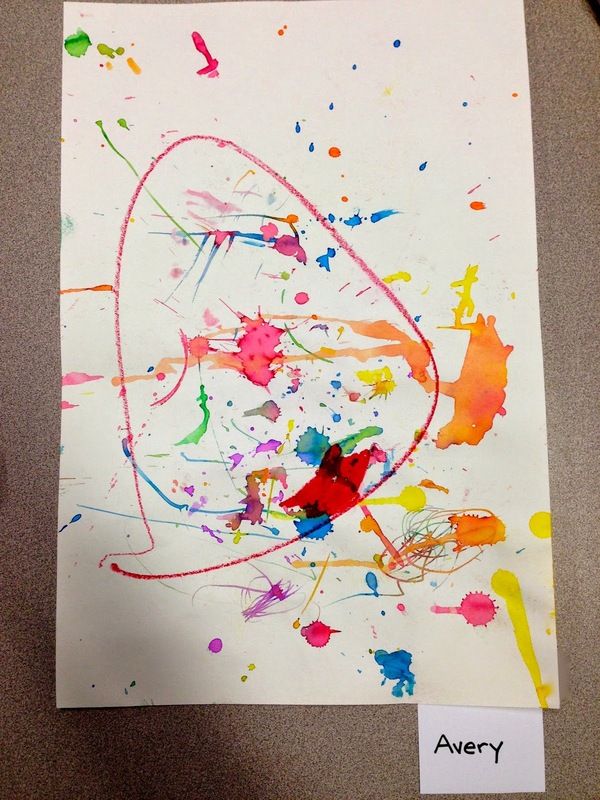 I set up paint containers with rainbow colors and the children used tweezers to retrieve the yarn from the paint, then laying this bright yarn onto paper which made a yarn print. 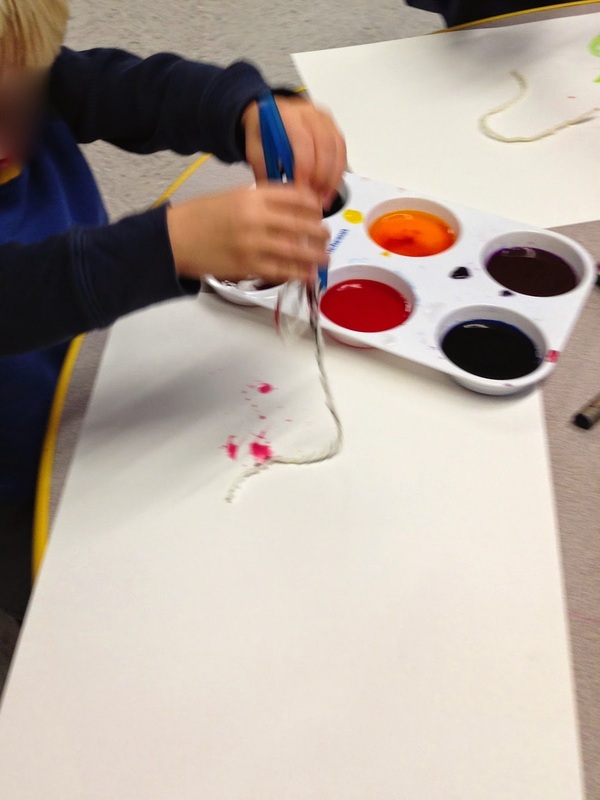 I enjoyed watching the children explore the tweezers with the yarn and paint. Specifically, I enjoyed watching their hands at work. 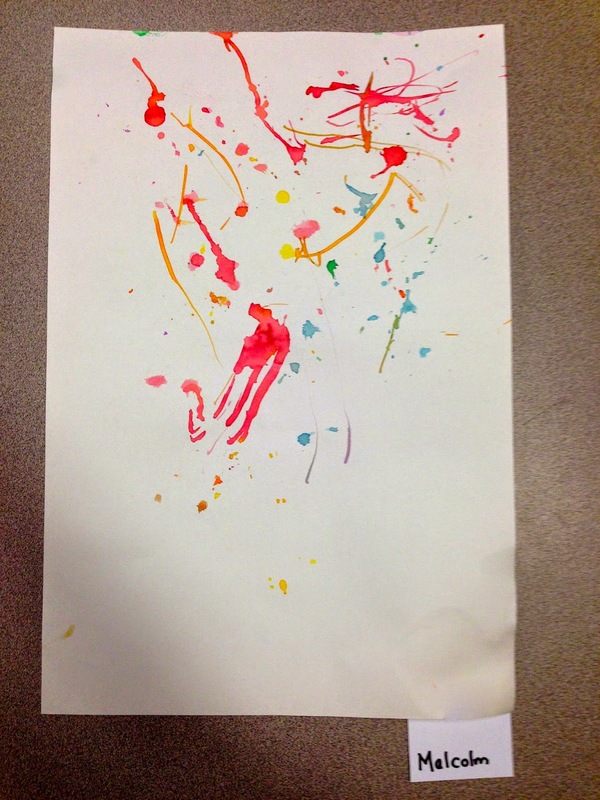 Truly, it is magical to watch children's hands at work. 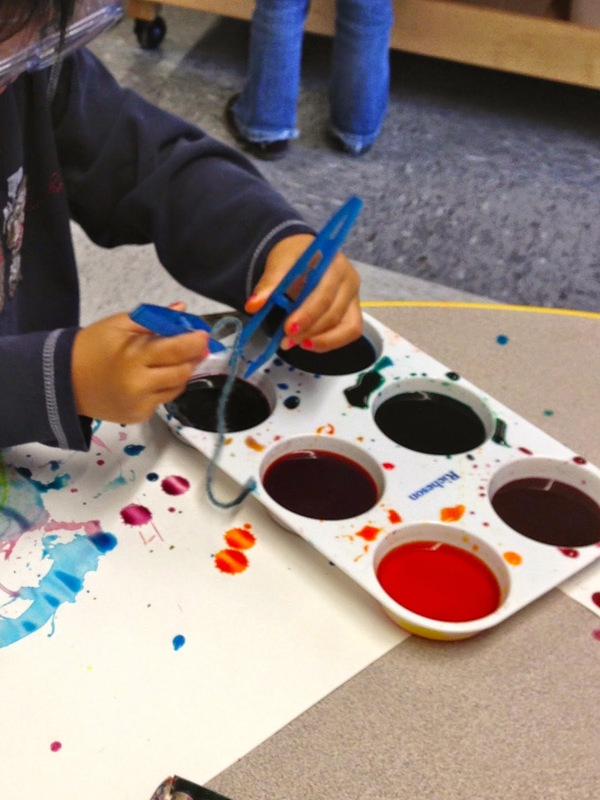 Others used their fingers in the paint, moving the yarn about with their hands. 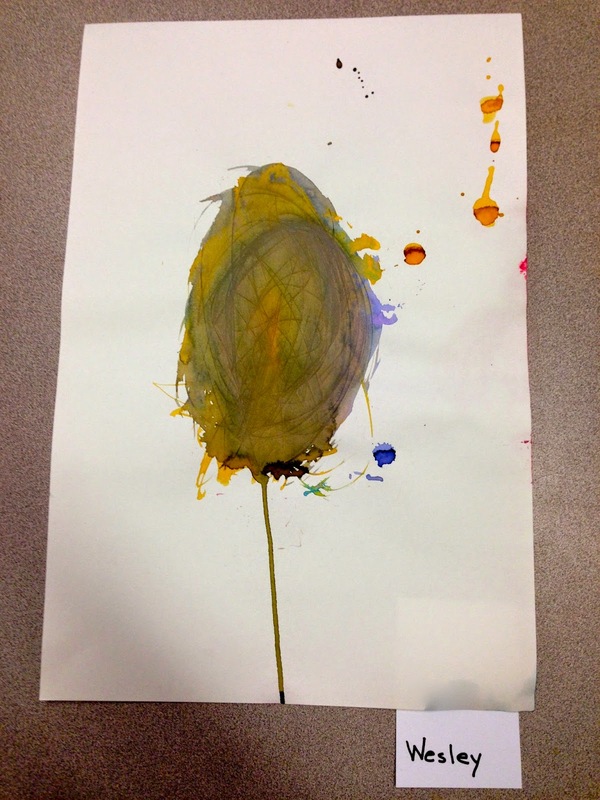 Some dipped the tweezer into the paint - not the yarn - and dragging this painted tool across the paper. 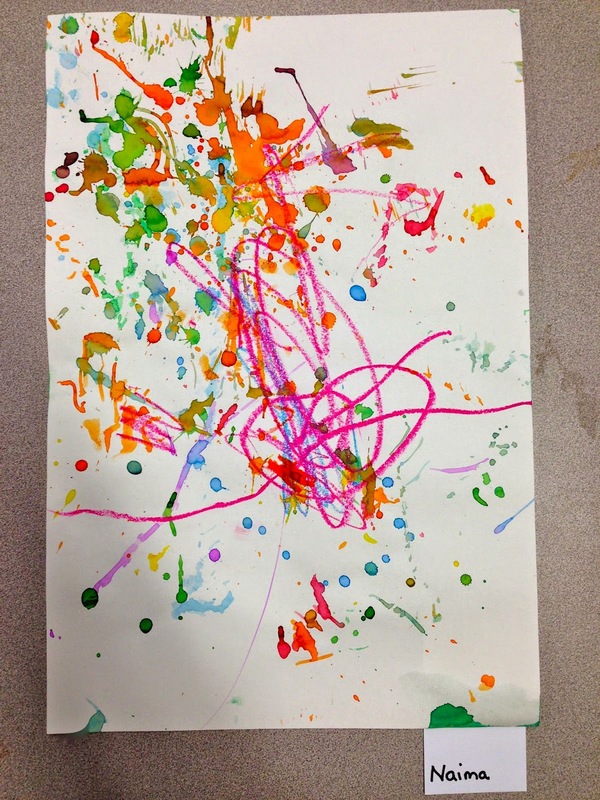 One young artist dipped the yarn into the watery paint and then pulled the yarn taut, sending sprinkles of paint everywhere. 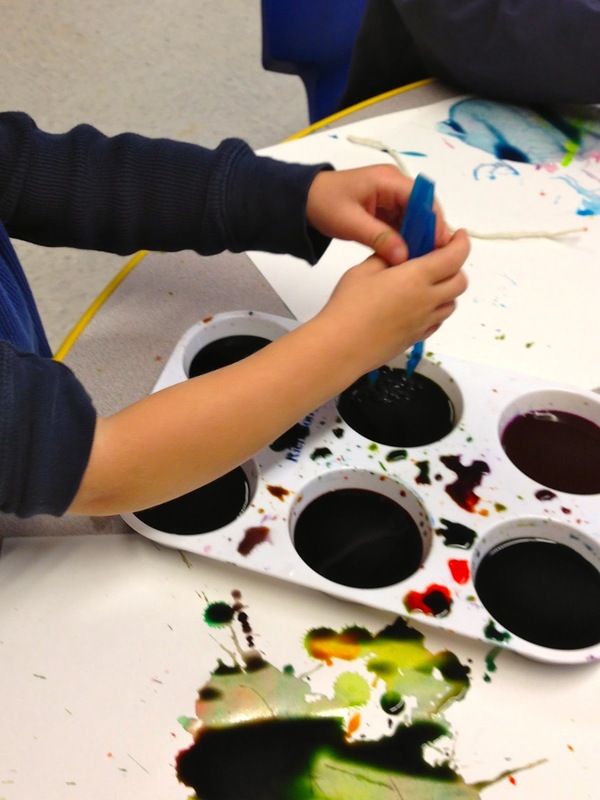 Many children found mixing the colors together to be an irresistible goal, quickly turning each watercolor paint container into brown. 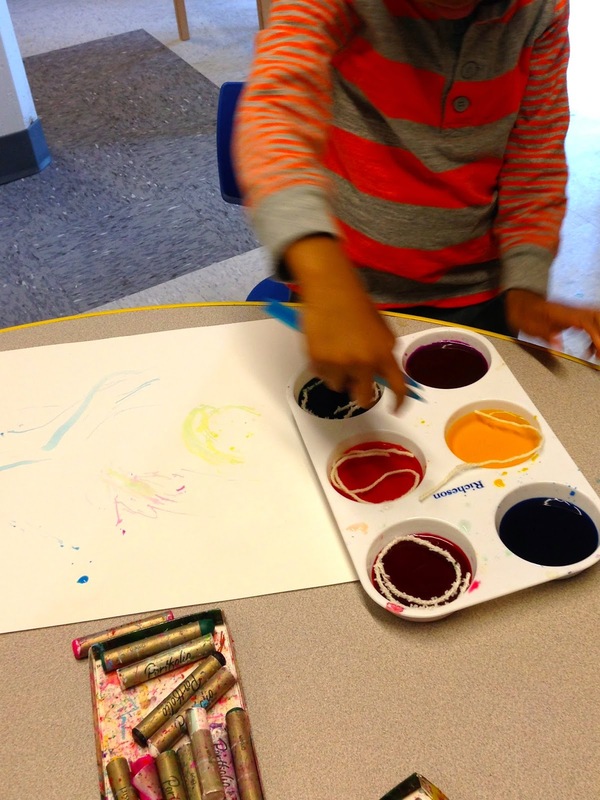 all succeeded in creating magical paintings. 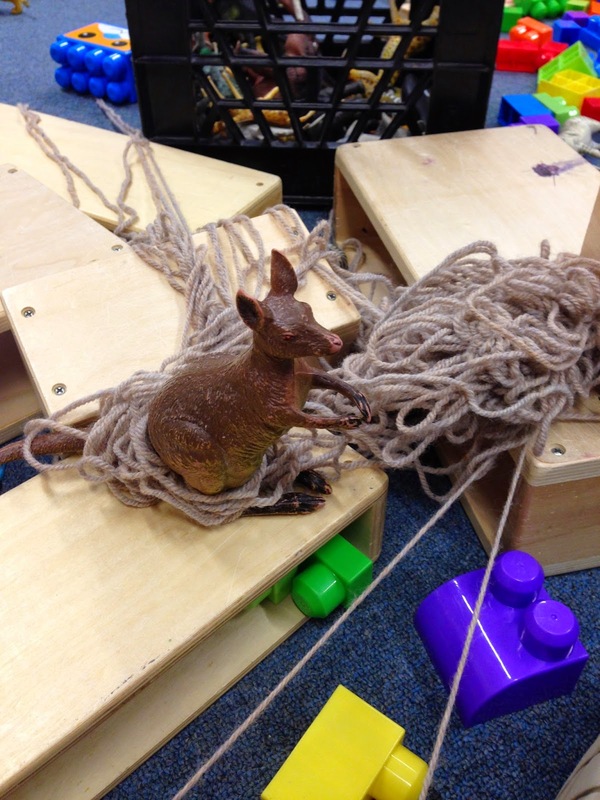 It was so much fun to explore yarn in depth…to see limitless possibilities of this basic material. Tuesday SOL What topic interests us the most? 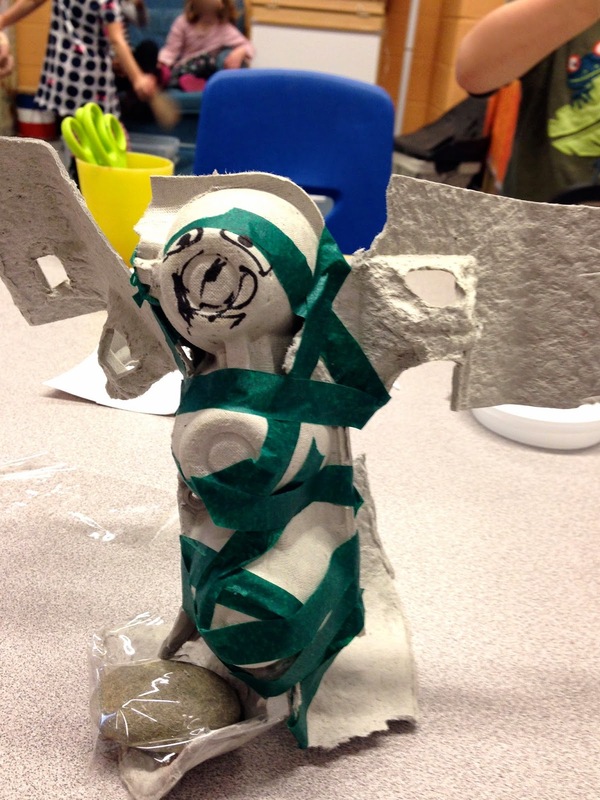 It is Intersession week! 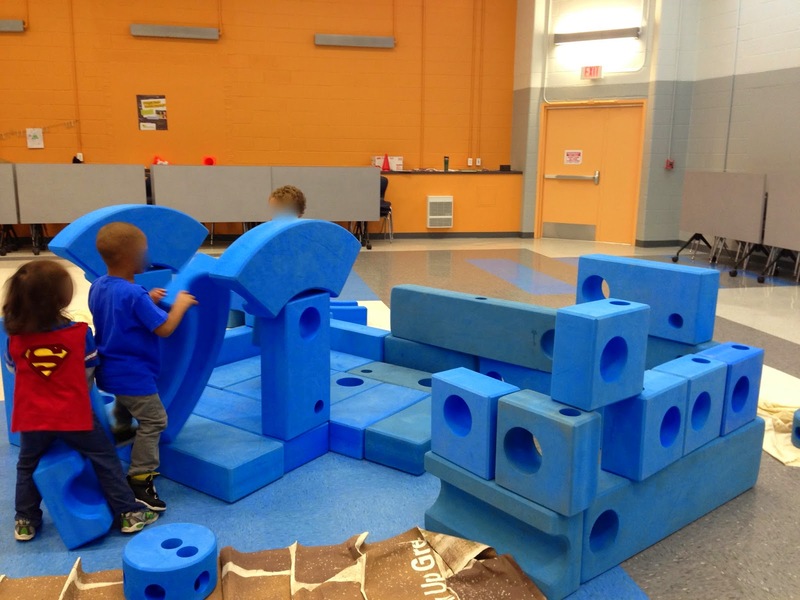 This week - Tuesday through Friday - we have Intersession for an hour each morning instead of centers. 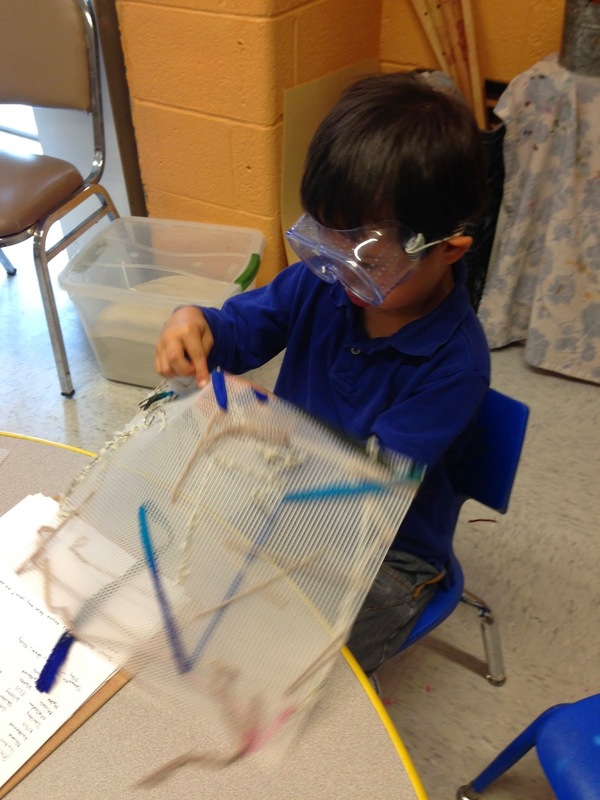 Each child explores one topic for the whole week, often a topic that is not usually part of the school curriculum. 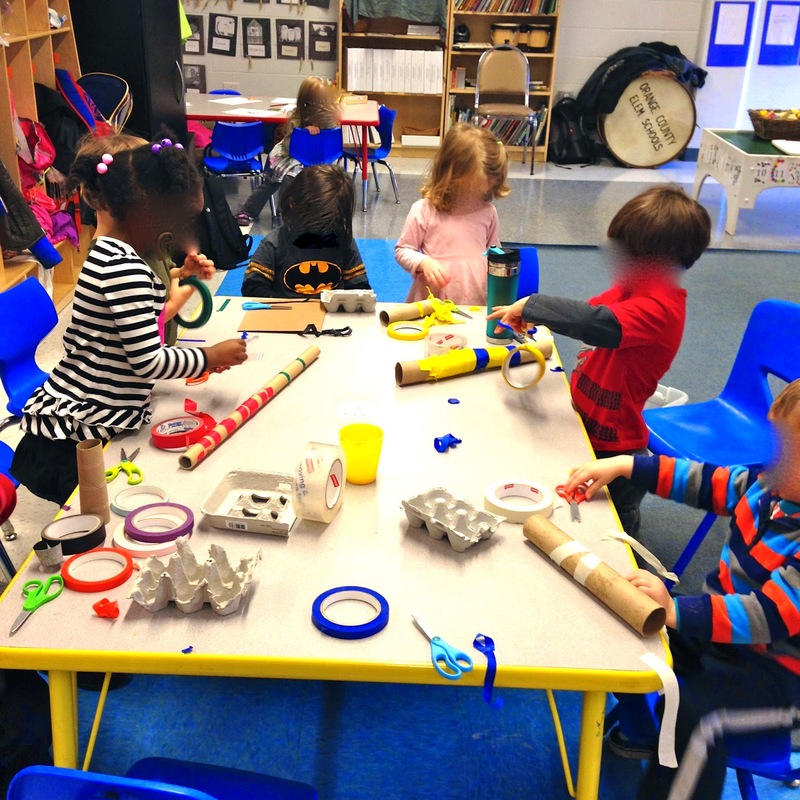 All the children work in mixed age groups - preschool and Pre-K students together, in groups of only 10-12 students [compared to my usual class size of 22!]. 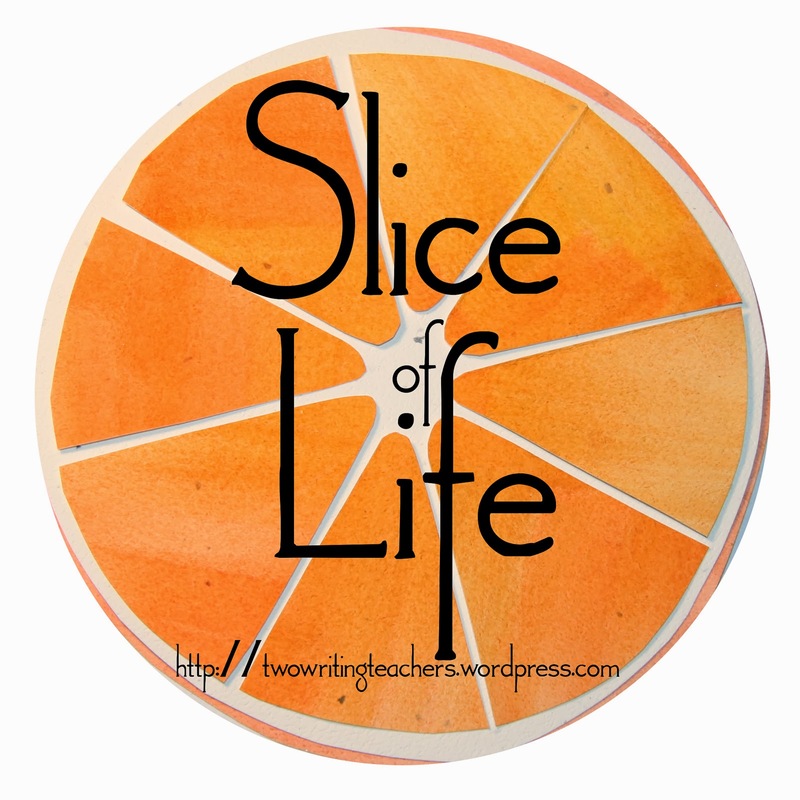 The Teaching Residents run classes, some parents run classes. 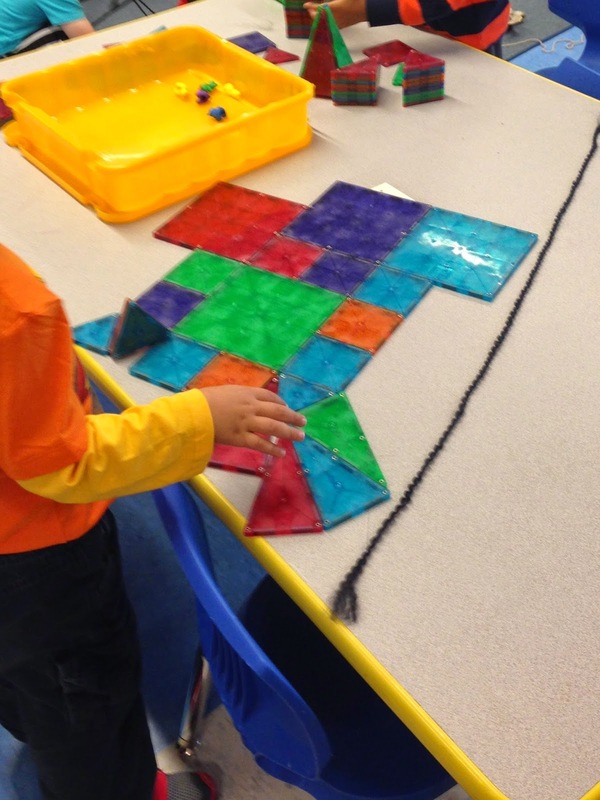 Intersession is a chance to work in new ways with different students and teachers, and typically a different classroom, too. 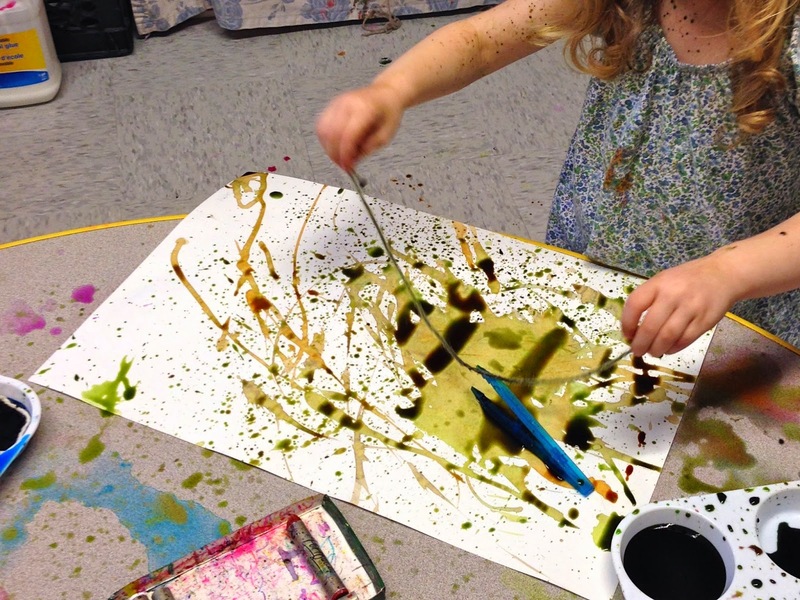 It is interesting to see how children handle the the new routine...for one crazy hour each day, everything is a little mixed up in a totally fun way! Well, the joke was on me! 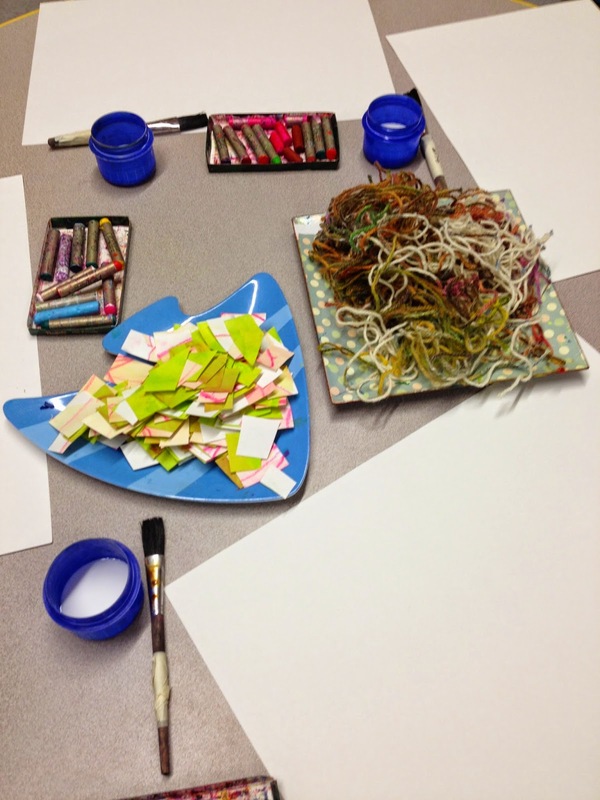 Every time I concluded my pitch and declared, "If this sounds like a fun class to you, come join me at this station! 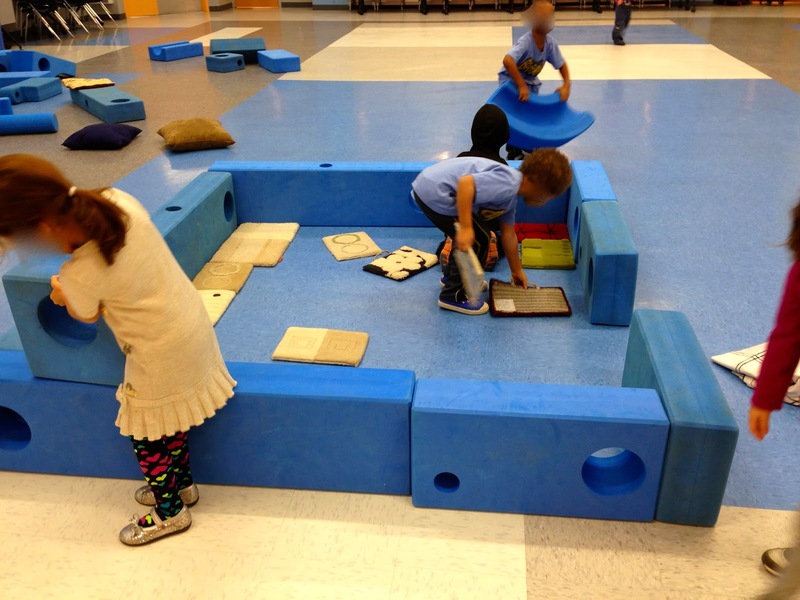 ", my entire class of preschoolers would come running over to this vicinity. 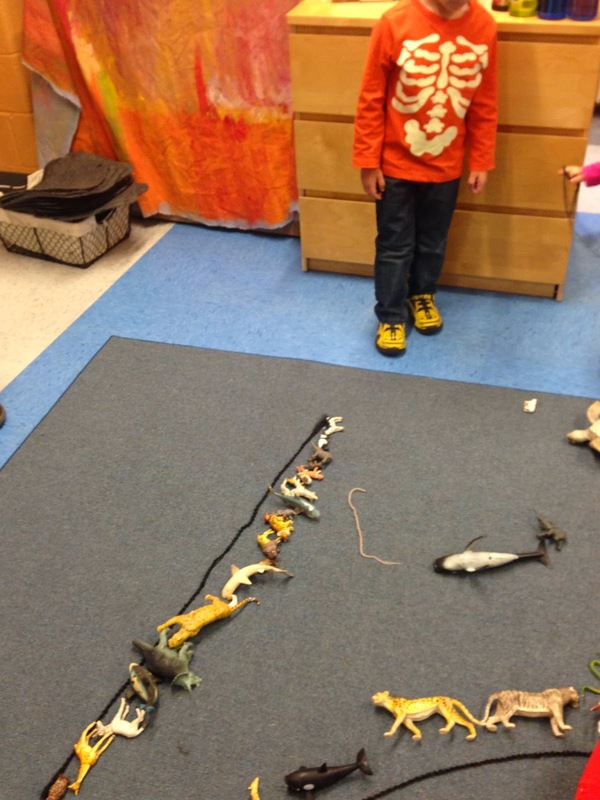 Yes, they ran from station to station, as I shared what was great about the topic. I turned to my Teaching Resident and said - "Well, this "voting technique" was a total fail on my part! 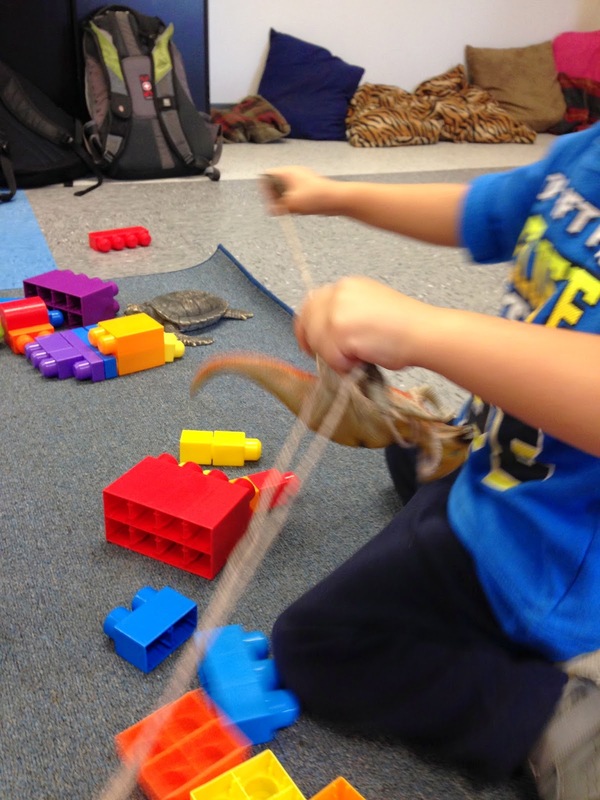 These preschoolers love everything we do and I don't know anymore about their favorites now than I did at the outset of our day." The idea of choosing one topic to the exclusion of all others made absolutely no sense to them. Clearly, they are happy will all the choices offered - and amenable to try new things. This is a great disposition to have! 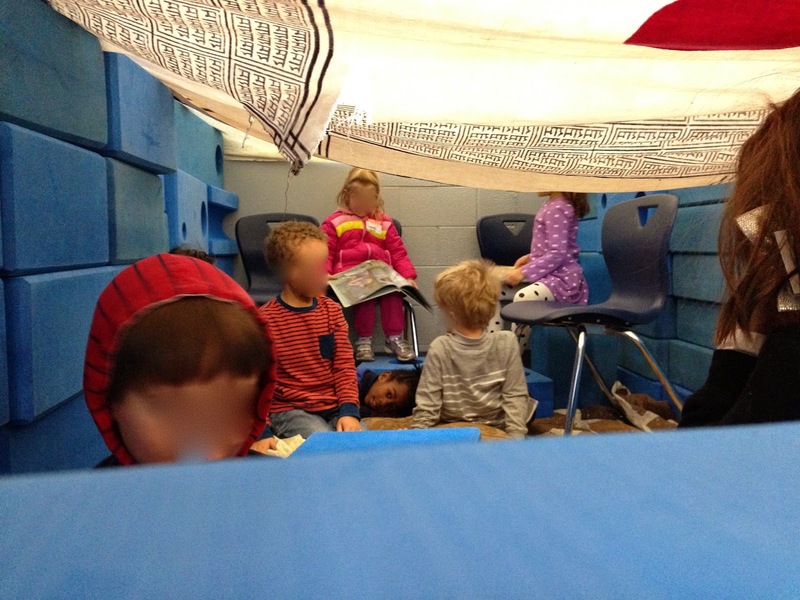 Ms. Wright and I are leading the "Forts" Intersession and we had such a fun start today! 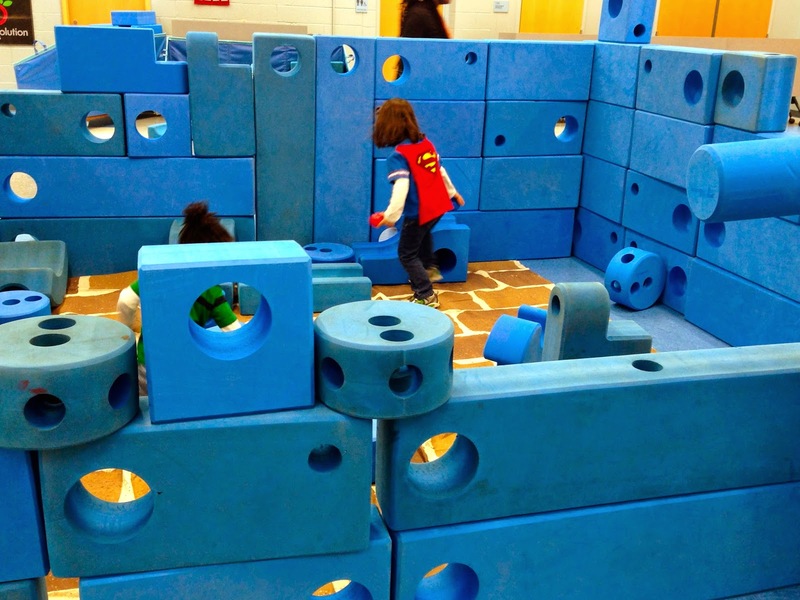 We have these amazing 'blue blocks' [Imagination Playground blocks] to use. 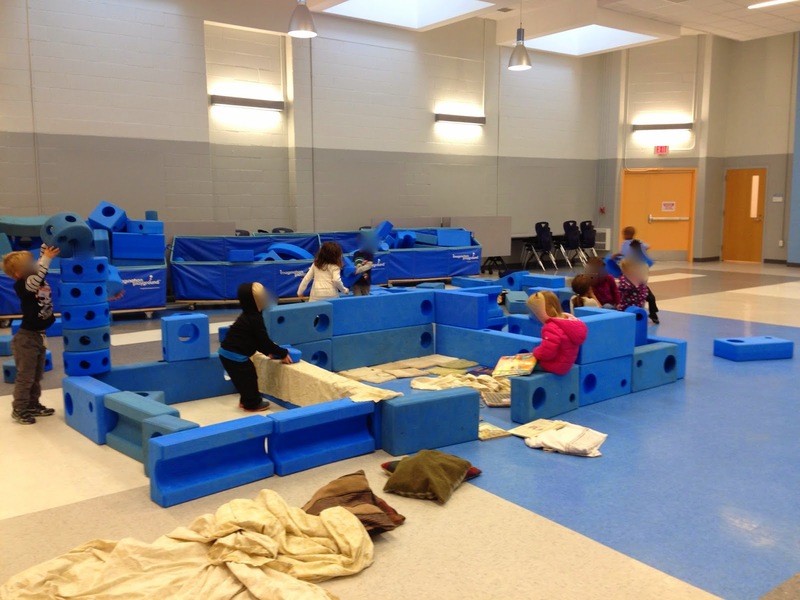 However, for Intersession week, my group of 12 fort builders has access to all six bins of the blocks! We are working in the all-purpose room, an enormous space for a group of only 12 students. 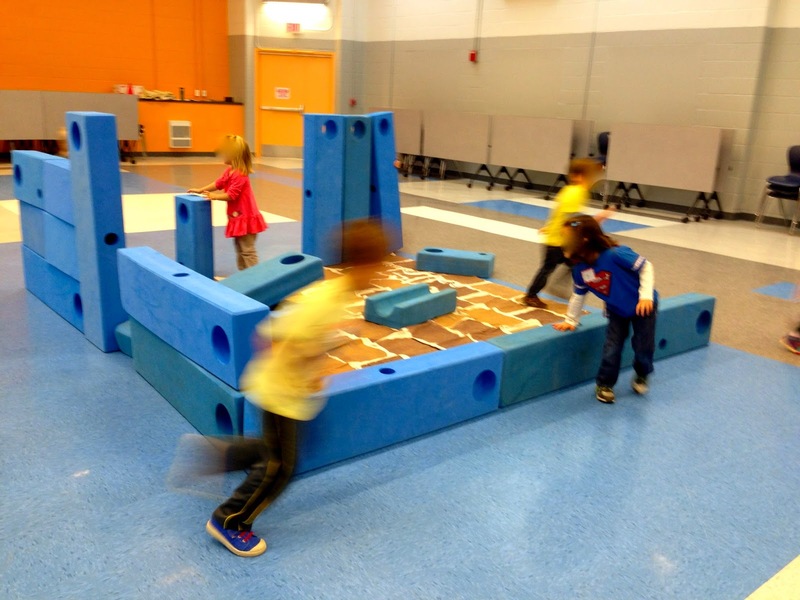 "a fort is a cozy corner"
The children set right to work to create the largest fort ever…they ran and ran, grabbing blocks that they needed and laying them this way and that, surrounding a large canvas flooring. 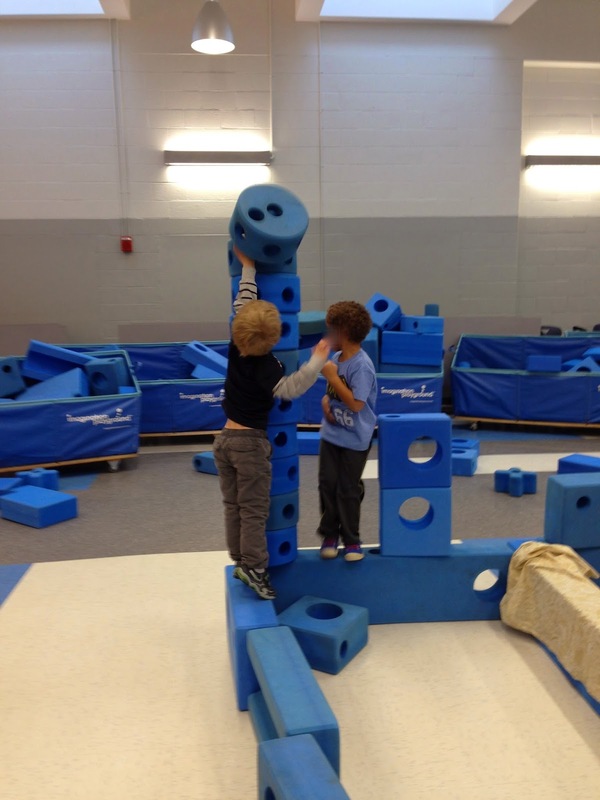 I couldn't believe how quickly it grew in height…how well these children worked together, focused on the same goal. 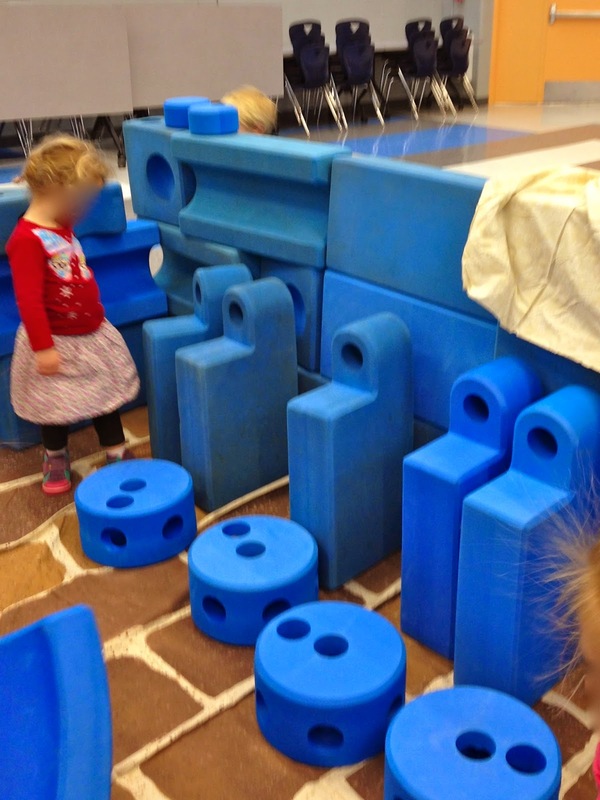 There was much debate about the door to the fort - Should it be a drawbridge? Should it be more like a real door that opens when you pull on it? 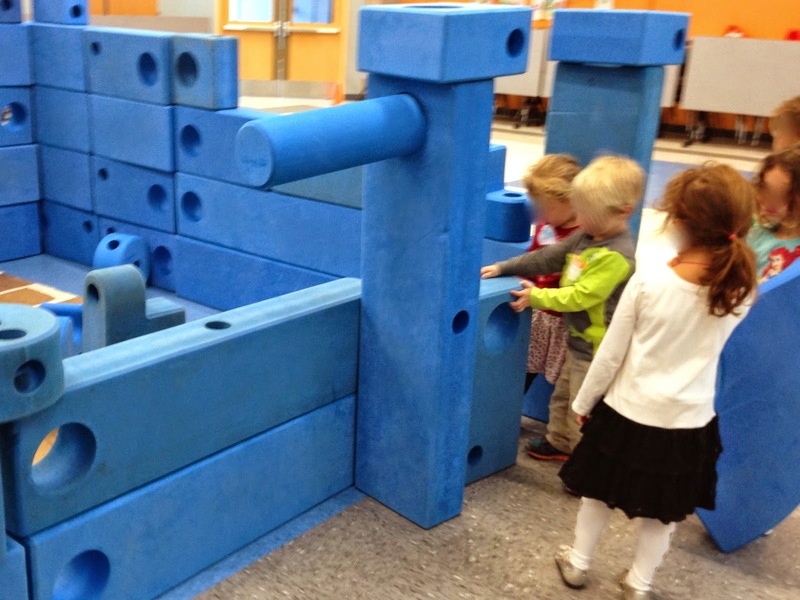 Should we build it with blocks? Should we use a cloth? 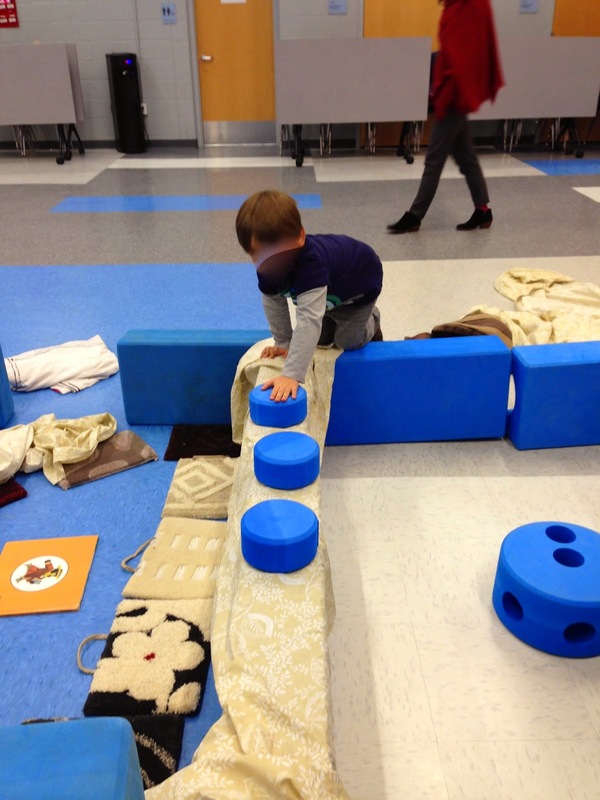 All of this debate was simultaneous with trial and error - blocks put in position to be a door, then toppling over, then swung open, then dropped to the floor like a bridge, then a call for a sheet followed by the need to place it just so - How to hang a sheet? How to weigh it down so that it stays in position? It was fast and furious work. With the walls and door completed, now we needed to think of the interior amenities. A couple rectangles were brought in as beds, some squares as seats, and several curved pieces were brought in to be "rocking horses" in the fort…but these pieces shown above had another purpose. Any guesses? Tess said "We need a bathroom!" 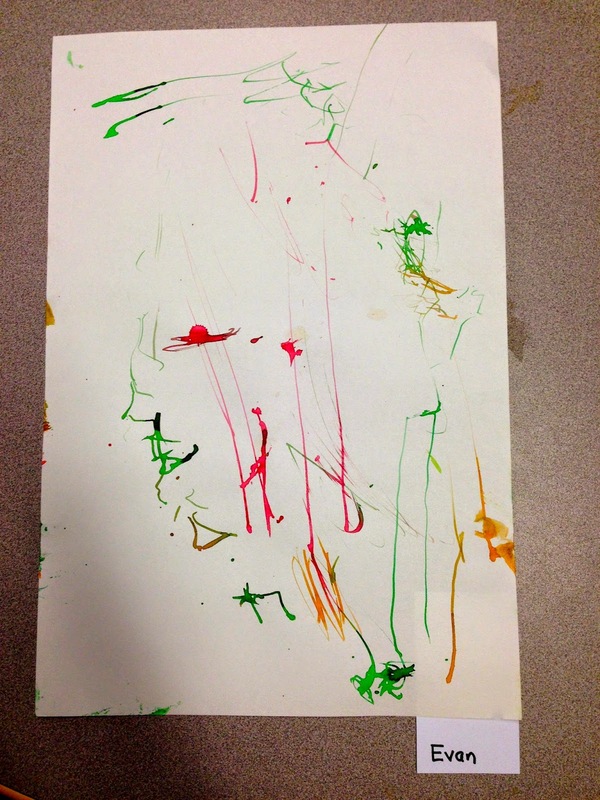 and Cameron declared, "I can make a toilet!" 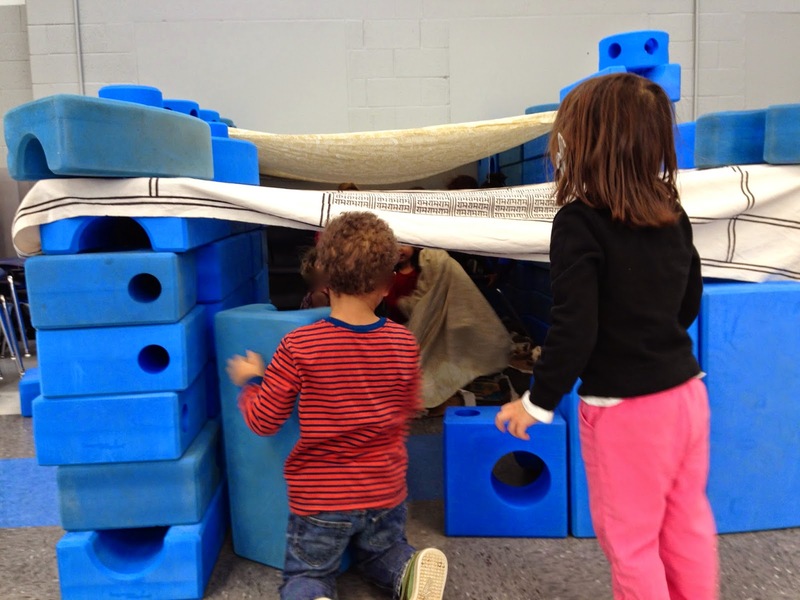 and then the children worked together on creating these, with Nora declaring - "We have five toilets in our fort!" 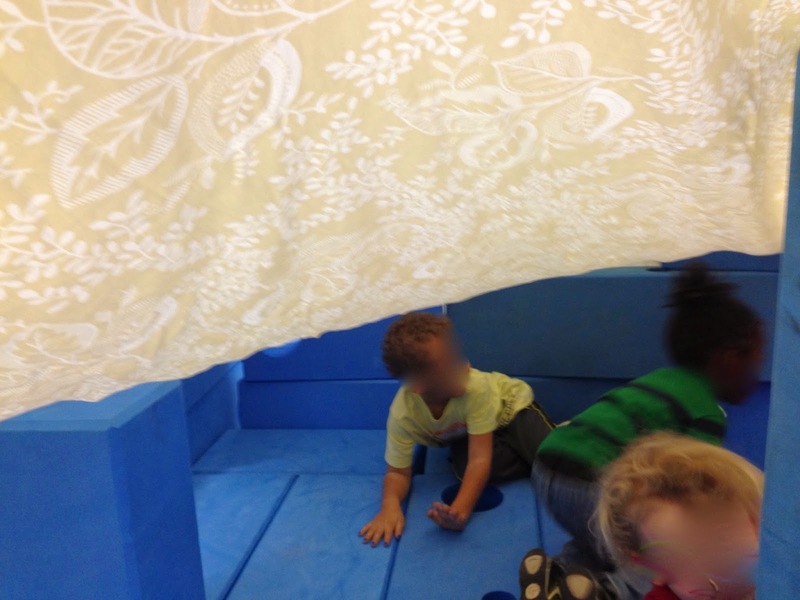 Near the end of this interior design, Ms. Wright and I began to lay a large sheet on top of the fort for the roof. 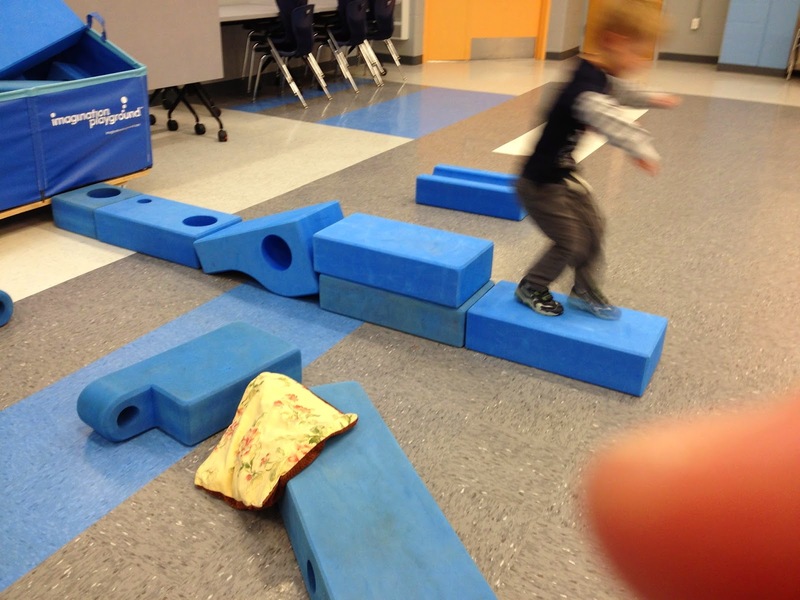 All the children raced inside the fort for this fun step in the process, squealing with delight - "It's a real fort!" 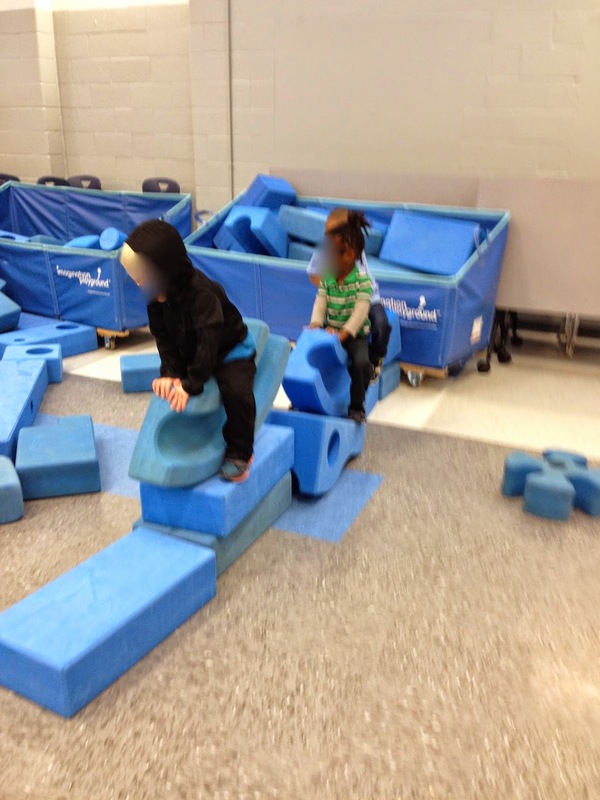 A muddle of blocks and still happy preschoolers. 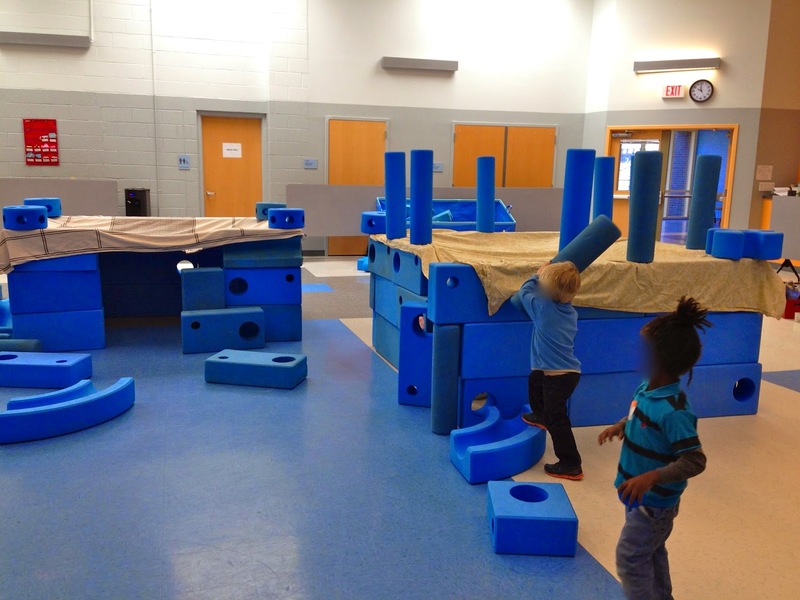 They went right back to work on a new fort. 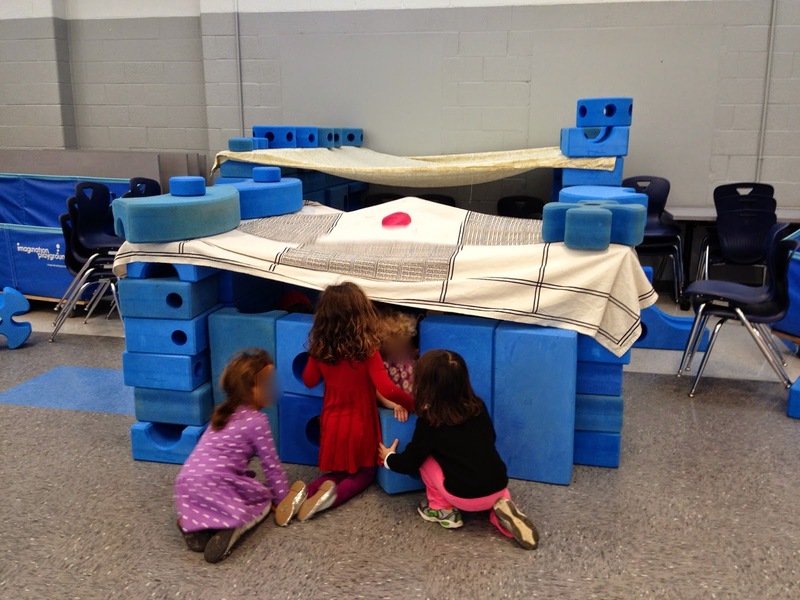 By the end of our Intersession hour, we never did succeed in getting a roof on any structure. 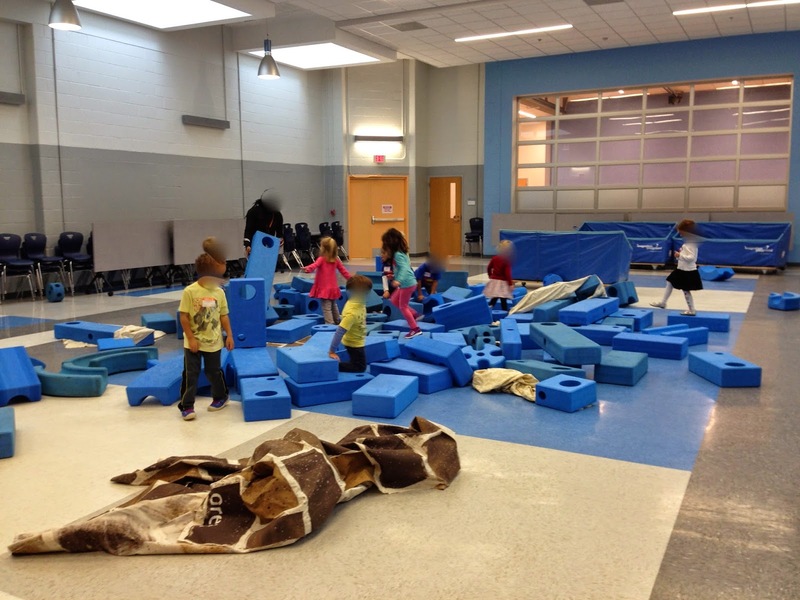 But we sure did a whole lot of fort building. Yes, we are going to have a super fun couple of days. Can't we make this just a little higher?